Habit: Annual, perennial herb, unarmed. Stem: generally sprawling or climbing, ridged or angled. 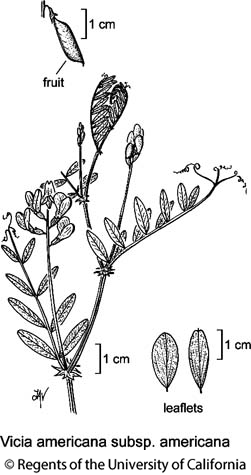 Leaf: even-1-pinnate; stipules with an upper and smaller lower lobe, entire to dentate; leaflets 4--many, alternate to opposite (often on 1 pl), linear to ovate; main axis generally ending as tendril. Inflorescence: raceme or cluster, axillary; peduncle or pedicels present; bracts small or 0. Flower: corolla generally lavender to purple, occasionally white or yellow; 9 filaments fused, 1 free; style generally not +- flat, puberulent at tip, all around or especially abaxially. Fruit: dehiscent, generally +- oblong, generally flat; base stalked or not. Seed: >= 2. Habit: Perennial herb, hairy or glabrous. Stem: sprawling or short, erect, to 1 m. Leaf: stipules generally sharply lobed; leaflets 8--16, 1--3.5 cm, widely elliptic, wedge-shaped, to narrowly oblong, tip acute, truncate, notched, or 1--5-toothed. Inflorescence: +- = subtending leaf; flowers 3--9, generally spaced, on > 1 side of axis (except occasionally when pressed). Flower: calyx attachment oblique, lobes unequal, lower 1.5--4 mm, > upper; corolla 15--25 mm, generally blue-purple to lavender, length when pressed 2.5--3.5 × width. Fruit: 2.5--3 cm, 5--7 mm wide, glabrous or hairy; stalk-like base 2--5 mm. Chromosomes: 2n=14. Ecology: Generally open, moist forest, along streams, disturbed areas; Elevation: < 2400 m. Bioregional Distribution: CA-FP (exc NCo, SCoRI, s ChI), GB (exc Wrn, W&I); Distribution Outside California: North America (except southeastern United States). Flowering Time: Mar--Jun Note: Often mistaken for Lathyrus. Unabridged Note: Use of leaflet form, hairs to define infraspecific taxa untenable. Citation for this treatment: Robert E. Preston & Duane Isely 2012, Vicia americana subsp. americana, in Jepson Flora Project (eds.) Jepson eFlora, http://ucjeps.berkeley.edu/eflora/eflora_display.php?tid=53345, accessed on April 20, 2019. CA-FP (exc NCo, SCoRI, s ChI), GB (exc Wrn, W&I); Markers link to CCH specimen records. Yellow markers indicate records that may provide evidence for eFlora range revision or may have georeferencing or identification issues. Purple markers indicate specimens collected from a garden, greenhouse, or other non-wild location.